Most folks know Samhain as Halloween, but for many modern Pagans, Samhain is considered a Sabbat to honor the ancestors who came before us, marking the dark time of the year. It's an excellent time to contact the spirit world with a seance because it's the time when the veil between this world and the next is at its thinnest. "The timing of contemporary Samhain celebrations varies according to spiritual tradition and geography. Many of us celebrate Samhain over the course of several days and nights, and these extended observances usually include a series of solo rites as well as ceremonies, feasts, and gatherings with family, friends, and spiritual community. In the northern hemisphere, many Pagans celebrate Samhain from sundown on October 31 through November 1. Others hold Samhain celebrations on the nearest weekend or on the Full or New Moon closest to this time. Some Pagans observe Samhain a bit later, or near November 6, to coincide more closely with the astronomical midpoint between Fall Equinox and Winter Solstice." Contrary to a popular Internet-based (and Chick Tract-encouraged) rumor, Samhain was not the name of some ancient Celtic god of death, or of anything else, for that matter. Religious scholars agree that the word Samhain (pronounced "sow-en") comes from the Gaelic “Samhuin,” but they’re divided on whether it means the end or beginning of summer. After all, when summer is ending here on earth, it’s just beginning in the Underworld. Samhain refers to the daylight portion of the holiday, on November 1st. Around the eighth century or so, the Catholic Church decided to use November 1st as All Saints Day. This was a pretty smart move on their part. The local pagans were already celebrating that day anyway, so it made sense to use it as a church holiday. All Saints’ became the festival to honor any saint who didn’t already have a day of his or her own. The mass which was said on All Saints’ was called Allhallowmas, the mass of all those who are hallowed. The night before naturally became known as All Hallows Eve, and eventually morphed into what we call Halloween. This is a good time for us to look at wrapping up the old and preparing for the new in our lives. Think about the things you did in the last twelve months. Have you left anything unresolved? If so, now is the time to wrap things up. Once you’ve gotten all that unfinished stuff cleared away, and out of your life, then you can begin looking towards the next year. For some Pagans, Samhain is when we honor our ancestors who came before us. If you’ve ever done genealogy research, or if you’ve had a loved one die in the past year, this is the perfect night to celebrate their memory. If we’re fortunate, they will return to communicate with us from beyond the veil and offer advice, protection, and guidance for the upcoming year. 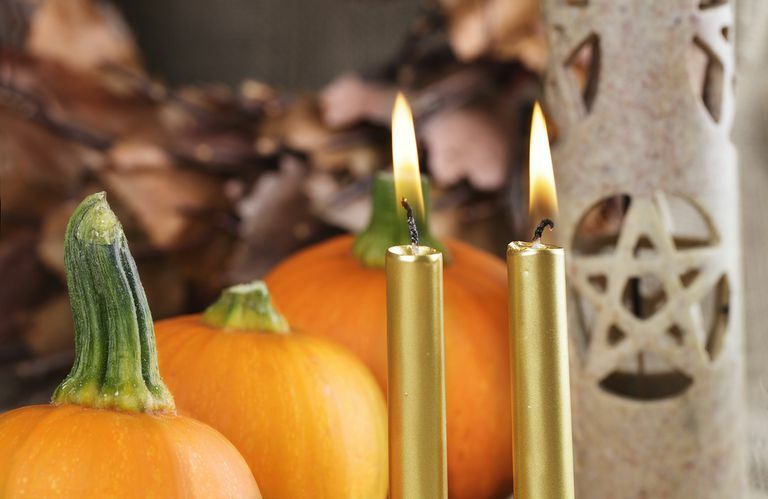 Try one, or all, of these rituals to celebrate Samhain and welcome the new year. Even if you're celebrating Samhain as a Pagan holiday, you may want to read up on some of the traditions of the secular celebration of Halloween. After all, this is the season of black cats, jack o'lanterns, and trick or treating! And if you're worried that somehow you shouldn't celebrate Halloween because it's somehow disrespectful to your Pagan belief system, don't worry, it's entirely up to you, and you can observe if you like, or not! Go ahead and decorate to your heart's content; you're even allowed to have silly green-skinned witch decorations. Are There Christian, Pagan, or Secular Influences on Halloween?